Wow Factor: "hard to beat at 3X more"
After the 2011 release of Oppo's versatile BDP-105 universal player with ESS Saber32 DAC and quite good, knobless headphone amp, I wondered what the company could do with a dedicated DAC/headphone amp. With the proliferation of computer-sourced audio from HD Tracks, Acoustic Sounds, 2L, etc., and an increasing interest in quality headphone listening to showcase all that hi-res detail, a headphone amp seemed like a logical product for Oppo. I mentioned my idea to the Oppo marketing folks, and tucked the thought in my back pocket. Then at CEDIA 2013, Oppo told me, privately, that a hi-performance headphone amp/DAC was in development, as well as a set of planar magnetic headphones. The duo were slated for on sale status by the first quarter of 2014, and they delivered on time. The new Oppo HA-1 ($1,199) and the PM-1 headphone ($1,099) are, as I expected, fantastic performing, and not that expensive — in audiophile terms. In fact, the HA-1 — with its discrete HP output section, top-end ESS Sabre32 DAC chip, ability to play PCM up to 32/384 and all flavors of DSD — is a downright bargain. Oppo even listened to my request for a word-length indicator, a rarity in most DACs. (Review Update! EAN's Oppo PM-1 planar magnetic headphone review is now on line: click here! The Oppo HA-1 is priced at $1,199 direct order. The unit is an attractive, large headphone amp/DAC that comes in a silver or black finish. The unit sports a front panel LCD display with several menus, including set up and input. The front also contains the unbalanced and balanced headphone jacks, large analog volume knob, push-on power button and the menu adjustment knob. The back panel includes analog balanced XLR and unbalanced RCA outputs, as well as analog RCA and XLR inputs for use as a basic preamp. Digital connections include SPDIF coax, TOSlink, and AES/EBU balanced XLR. There are no digital outputs or digital pass-through routing. The heart of the system is the ESS Sabre32 chip and the discrete, Class A analog gain components in the headphone audio path. A peek inside the HA-1 shows a large power supply and related parts and very clean PCB. Since this is a headphone amp first, the premiere design and parts implementation are focused on that circuit. The unit has user flexibility with its line outputs, but the output parts scheme is a bit more standard with typical op-amps. If you listen to an HA-1, the headphone circuit is where it’s at. The HA-1 is the utmost in versatility. For uncompressed PCM, it decodes up to the ultra-high sample rates at 32-bit/352 and 32-bit/384 through the USB input. Though rare, there are some 24-bit/352.8 recordings from 2L; none commercially available yet at 24-bit/384, but there are a few 384 A/Ds, and I made a few guitar recordings using an Antelope Eclipse A/D to test the HA-1’s playback at the highest rate, as well as playing DXD from 2L. To play ultra-high sample rate PCM, I used my Macbook Pro and Audirvana player software, as well as a Dell Venue 8 Android tablet and USB Audio Player Pro software. The HA-1 also is adept at playing DSD: at the standard 2.8 MHz (1X) sample rate and 5.6 MHz (2X) sample rate (native and DoP). It can also decode at the 11.2 MHz sampling rate in native mode, but I have yet to find any material in that format. All DSD is input via USB. The SPDIF and AES/EBU inputs handle up to 24-bit/192 PCM. The HA-1 can also play USB audio from iPod and iPhone up to 48 kHz sample rate (using the HA-1’s front panel USB input, as well as decode Bluetooth, beamed wirelessly from various sources, using AptX processing. Android devices can be connected to the rear-USB input when using OTG cable. USB Audio Player Pro even allows 24/384 via Android devices, which can be decoded by the Oppo. At $1,199. 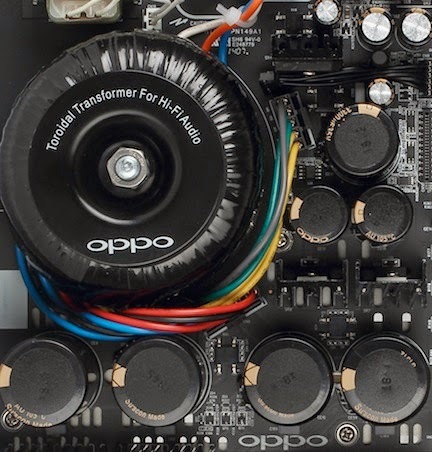 the Oppo HA-1 is an outstanding DAC/headphone preamp — with the ability to connect to computers, tablets, and smart phones at the highest resolution available, as well as the typical digital player. When using the discrete headphone audio path, the sound is magic. Without hesitation, an EAN Stellar Sound Award. 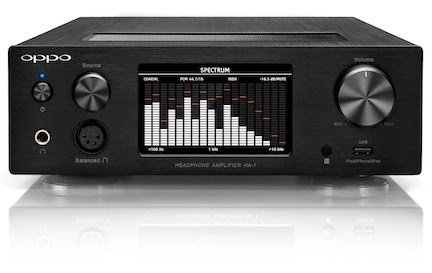 Spec wise, the headphone amp section via digital input boasts a 120 dB dynamic range and 111 dB S/N. The analog in/HP out are a few dB less in performance. Distortion is extremely low at any input/ output configuration. In my opinion, the HA-1 discrete analog path in the headphone stage sounds so good that I ended up using that output for headphone and as a line out to my various amps. With a simple audiophile 1/4-inch-to-RCA output adapter, the HA-1’s excellent, airy, detailed sound could be carried over to speaker listening. The op-amp enabled line outs are good, but the headphone section is exceptional — more space around the instruments, as delivered by 24-bit. The HA-1’s operation is quite modern. In fact, the user-selectable screens look like touch screens., but are user controlled via the function knob. Oppo said it would have added considerable cost to add touch screen functionality. The input screen shows icons for all the various inputs: analog, SPDIF TOSlink and coax, AES /EBU, computer USB, mobile device USB and Bluetooth. The monitoring window features three screen options: a graphic spectrum plot to 20 kHz, VU meters, or the input status info screen; both screens also include word length, sample rate input, volume level and high/low gain status. Other on-screen menus include: high/low gain setting for better matching to headphones and external components, screen brightness, mute and analog/digital home theater bypass. As a Class A device, the HA-1 feels quite warm, bordering on hot. You don’t want to put other components on top. It could, however, keep your coffee warm. BTW, I have to thank Oppo for listening to my request for adding a word-length indicator. With the variety of output setting parameters on computer audio programs, you need a word length indicator on the DAC to ensure you are getting the best quality playback from native format playback. With more than 15 years experience with computer audio, I know what it is to fly blind with regard to computer digital output. Many times my Mac’s Core Audio system has mysteriously changed output from the music’s native resolution to either a reduced word length and/or reduced sample rate audio from its USB output or SPDIF TOSlink output. For example on Audirvana, I can play 24-bit/192 music after playing 16-bit/44.1 music. Nine times out of ten, when I switch to the 24-bit/192 music, the DAC indicates that I am getting 16/192. I then have to go back into the computer setting and manually select 24-bit. Without the word-length status on the DAC, I would not have discovered the word-length reduction. If you are listening to computer-based audio, the only way to truly know if you are getting the native word length and sample rate is to have onboard status display on the DAC. And, like the Benchmark DAC2, the HA-1 shows active bits, not just the status bits. Because of its wide feature set and utility, the HA-1 is not just for audiophiles; professional audio engineers and serious home recordists owe it to themselves to check it out. The quality of the discrete headphone circuit is such that it is an ideal DAC for computer mastering, tracking and mixdown tasks — in the same range as the Benchmark and Mytek audiophile/pro DACs. If you work with DSD, its ability to deliver all three sample rates means the Oppo has you covered for quality listening to the mixdown, or direct-to two track DSD recordings. The Oppo HA-1 was utilized in three audiophile scenarios: as an audiophile DAC/headphone amp, as a DAC/preamp — via the discrete HP jack and adapter — and as a DAC/preamp through the standard op-amp line-outputs. I also tasked the HA-1 in my home recording studio. The HA-1 was used to monitor 24-bit/192, 24-bit/384 and DSD 5.6 MHz acoustic and electric guitar tracks recorded on a TASCAM DA-3000 or straight to the computer using the Antelope Eclipse A/D. I also did A/B comparisons with other DACs: Benchmark DAC2-D, Mytek Stereo 192-DSD, and the Teac UD-501, by routing the HA-1 output into the fast switching Coda preamp and outputting the balanced signal to a Benchmark H1 headphone amp. Headphones included AKG K702SE, Shure SRH1840, Sony MDR-7510 and Oppo’s new PM-1 planar-magnetic ‘phones. For line out monitoring, the Oppo fed a Pass XA-30.5 or a Rogue Audio Medusa amplifier, which powered MartinLogan Montis or Pass SR2 speakers. The speaker amp connection was courtesy of Alpha-Core. All analog and digital connections were through WireWorld interconnects. The AC was routed through Essential Sound Products Essence II power cords and power strip. First up was audiophile playback of 24-bit/352.8 DXD classical music from 2L. A Dell Venue 8 tablet and USB Audio Player Pro software, relayed the tracks straight into the HA-1‘s USB input from the tablet, using an OTG USB cable. The AKG K702 SEs headphone was the headphone of choice for these sessions. On the Haydn/Bartok - Cello and Violin Duos, the HA-1 transmitted a gorgeous spread of these stringed instrument’s primary tones, subtle overtones and room reverb. I could hear the air around the strings, the tinges of room reverb and an amazing dynamic range. Great accuracy on the cello. The other headphones delivered the same consistent tonal signatures with their slightly different sonic attributes. The new Oppo PM-1 also was a good match with the HA-1 — with its silky smooth, airy ribbon character. Check out the separate review on July 15, 2014. With its discrete analog signal path, Oppo has managed to quicken the presentation of the Sabre32 chip; it’s a tad tighter sounding than an Oppo BDP-105 — with more energy on top and a well-proportioned stereo spread. When I did my Coda preamp listening sessions between the Mytek, Oppo and Benchmark, all using Sabre DAC chips, the Oppo was the least warm, but the detail just pops right out of the monitor system. The Oppo HA-1 sacrifices some of the warmness, which allows presence and top-end frequencies to breathe. On a 24-bit/192 dub of Warren Bernhard - So Real SACD, the in-the-room drum cymbals were crystalline in their presence through the Oppo, and the Steinway piano tone was perfect. The Tuck and Patti — With Love CD, a minimalist recorded guitar and vocals album of pop standards, also sounded gorgeous through the HA-1. Patti’s vocal was full and out front and the acoustic and electric guitars provided a tasteful soundcape with a full-stereo image. Very nice. On the 24-bit/192 download, of John Coltrane - BlueTrain, the same positive sonic attributes emerged from cut to cut. A nice air around the drums, full horn tones and a generous helping of space. The horn was not harsh, but the brashness remained intact. On a PCM 24-bit dub of the Miles Davis — Someday My Prince will come, the cut titled Teo has a great intro: bass and drum cymbals, with a pronounced airiness around those cymbals. Again, not as warm as the Benchmark or the BDP-105 and other ESS Sabre 32 DACs I have auditioned, but I liked the Oppo’s tone. It is not too thin or too thick. The analog stage, to my ears, eeks out a bit more detail and instrument layering. The Oppo handles pop music with just as much ease. Though it is a slightly tighter presentation than other ESS Saber32 DACs, it is not harsh — just revealing. For example, the 2002 reissue of Willie Nelson — Red Headed Stranger through the HA-1, I could hear all of the detail and dynamic range of the Martin acoustic guitar, the room reverb, Mr. Nelson’s vocal hues, etc. Would love to hear a 24-bit remaster of that record. On the Jason Mraz - Love Is a Four Letter Word 24-bit/96 download, again, the Oppo opened up the presence a bit on the varied tempo songs, which are abundant in acoustic, electric and percussion instruments. 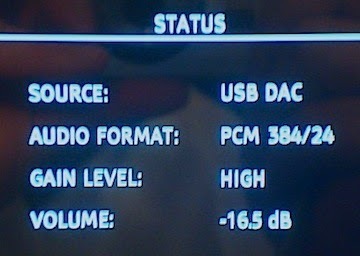 Though the recording is maxed to 0 dB and pretty loud, it was not harsh through the Oppo. The Benchmark also sounded really good on this recording. On the 2L 24-bit/352.8 Haydn/Bartok Cello and Violin Duos, the HA-1 transmitted a gorgeous spread of these stringed instrument’s primary tones, subtle overtones and room reverb. I could hear the air around the strings, the tinges of room reverb and an amazing dynamic range. Great accuracy on the cello. In comparison to the other DACs, the HA-1 is a bit more present sounding than the other Sabre32 DACs, extracting an increase in air that gives you the impression of more transient speed and openness. It gets closer to the coolness of the Teac UD-501's Cirrus CS4398, or the Analog Devices-equipped Benchmark DAC1, but smoother. The shades are not night and day, but the difference are observed via my chosen headphones and music. As a DAC/line output preamp for my Pass and Rogue Audio amps, the headphone jack was the clear winner compared to playing the music through the analog line outs on the back of the HA-1. The op-amp based line-out (balanced or unbalanced) does not quite have the same width and detail presentation as the headphone amp circuit. From a utilitarian aspect, it’s nice to have the line-out jacks to give you the flexibility to route signals to outboard gear, but the audiophile preference is the headphone amp output. Through both the Pass SR2 and the ML Montis speakers, the headphone jack-delivered audio featured a stereo image that was wider and deeper sounding, and upper-register piano notes and drum cymbals were more succinct than the regular line out jacks. Note to Oppo: gives us the discrete audio path for line output stage on version 2. For the money and the outstanding sound quality, there is not much to complain about with the Oppo HA-1. As mentioned, I would also like to have the discrete analog gain stage in the line-outputs. And since it has this wonderful DAC, how about an onboard media player, maybe an SD card or at least USB drive with onboard player software — like the Resonessence Invicta. These additions would be more money, but maybe it could be made for under $1,500? At $1,199. the Oppo HA-1 is an outstanding DAC/headphone preamp — with the ability to connect to computers, tablets, and smart phones at the highest resolution available, as well as the typical digital player. When using the discrete headphone audio path, the sound is magic. Without hesitation, an Everything Audio Network Stellar Sound Award. Great review! I'm nervous about connecting headphone outputs to a power amp. Are there any issues with the impedance offered by the HA-1 headphone output as compared to the line-out? Also, were you able to use the balanced headphone output? I would suggest to anyone considering this as a preamp to try all outputs. System matching is crucial with components, and if a headphone output works best for one individual, that does not mean it will (usually does not) work well for your setup. Nice review, albeit largely subjective. I did not have an issue driving power amps from the headphone jack. I should have mentioned that I drove a bunch of amps including the Rogue Audio Medusa (digital tube hybrid), Pass Labs XS 150 (super class A MOSFET), Bryston 14B SST, Pass XA30.5, even a Mac MC275. It drove them all cleanly. And best of all, I got the Oppo's HP discrete output with that extra openness and clarity on transients that is not as good with the op-amp based line out. As for balanced I did run the Oppo PM-1 HP with the balanced cable (the PM-1 review will post before the week is out). I heard no difference between balanced and unbalanced connection. Since I did not have two pairs to compare, I did not have a more objective A/B, but nothing jumped out from switching from one cabe to another. So if you had to choose between a Mytek 192 DSD or an HA-1 through headphone jack for speaker listening which one would you use? I own both. I love the Mytek for its DSD compatibility with my TASCAM pro gear and its headphone and line out are very good. Its line out is better than the Oppo’s op-amp line output. but the Oppo HP discrete output has noticeable width and depth over the Mytek on A-B testing, even as a line driver for an amp. The HP output is equal to much more expensive line preamps. in my opinion. Oppo also has lots of little ergonomic treats, including real time word length indicator, a rarity in the DAC world. BTW, Mytek has new Manhatten DAC; ot costs more. It has discrete output as well. Too bad this dac has no network. Most if files are stored on network and not only on usb drive. How new was your unit when testing? Have you noticed any difference in line outs by now if you still have it? It has been stated in user threads that the line outputs generally not optimally performing when new and it is reported with some burn in time the line outputs become transparent.. Yet I too agree the headphone out is leagues above and comparable to much more expensive gear. Also the dac portion is already near limits of best sabre performance so to get a better dac you would need a much more expensive dac with another type of chip probably only a top implemented AKM4399 chip type dac.. So bottom line is to upgrade from this oppo would mean spending at least four times as much on a "better" solution. .
John, how does the HA-1 compare to the Bryston BHA-1 headamp? The BHA-1 is an excellent headphone amp, plus line preamp. Its headphone output is a bit warmer than Oppo, but I often use it with other DACs. The HA-1's spaciousness, width and depth is still my favorite set of attributes. When I want to listen to HPs with microscope precision, it is my go-to. Been reviewing for months. Thanks for your input on Mytek 192, Oppo HA-1 and Benchmark DAC2 HGC. I think I have narrowed it to between the Benchmark and Oppo. I'm a purist on sound loving detail, separation of instruments, sound staging and depth. Not sure how much I will get into DSD level recordings but.. Headphones likely between Hifiman HE-560, BUT if I go with the Oppo I may consider Senn HD800 if it pairs better with it. This will primarily be used through JRiver on computer for headphone use. Given that do you have a direction you can point me in, preference or something I need to look at more carefully. I have great stereo equipment but try to do research the first time around so not to waste my precious money. Thanks for any help from your experience/s. Im a little late on this, But I have an oppo BDP 105D which has a headphone out, but to push my cans I need to turn it up to 90+. Would the Oppo HA-1 using Balanced cables out of the 105D to the HA-1 help with volume and sound quality ? Or since they have the same DAC there would not be much difference????? Thanks for any help. The HA-1 has plenty of gain with the normal and high gain mode for either unbalanced or unbalanced. for almost any load headphone. The discrete output HP amp is very detailed. For the money, it is hard to beat.